Putting wasn’t part of the first session at First Tee but there was still time to use the practice green. 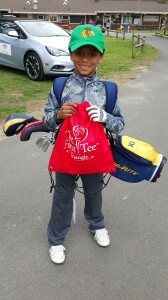 DURHAM, North Carolina — Everything that I had heard suggested The First Tee program was a most worthwhile thing, but I’d never seen the program in action until my grandson, Sterling Stewart, joined The First Tee of the Triangle for youngsters between the ages of 7-10. Sterling, 7, had a better introduction to golf than I did. After hitting balls on a driving range with his father a few times he had tried The First Tee program at Hillandale golf course last year, but many of the sessions were rained out. Hopefully this spring’s sessions won’t be, but the first session seemed well worthwhile. Hillandale is a municipal facility owned by the City of Durham. A basic, most friendly place, its 18-hole course is a Donald Ross design from the 1920s. It has a spacious practice range and First Tee headquarters are in a small building detached from the pro shop that could be used for very limited indoor instruction if needed. Sterling was one of about 40 youngsters showing up with their parents for the initial First Tee session there of 2016. They gathered around picnic tables, then the youngsters were sent off for some basic exercises while the parents were given an overview of the program. A bag of goodies to take home completed a big day for Sterling. Understandably this was much different than my introduction to golf. I was 11 years old when my mother took me to watch a round of the Western Open. (I think she was as interested in watching Arnold Palmer as much as she was introducing me to golf). After that experience turned out a pleasant one my mother rounded up one of her friends who had a son about my age. The four of us went out to play a round on a nearby Chicago public course. No practice, no instruction, just hit the ball and count your score. Sterling’s First Tee program at Hillandale was much different than that. After the parent orientation the youngsters were divided into two groups – one for those younger ones (like Sterling) who were trying the program for the first time and the other for those generally older ones with at least limited experience with the program. I had my doubts about the whole thing when Sterling’s group headed to the range without any clubs. The first lessons involved throwing golf balls, soccer balls and Frisbees. How did that have anything to do with learning about golf? I quickly found out. 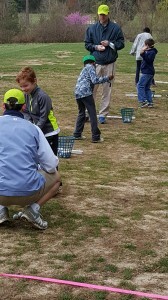 Instructors helped each youngster when they made their first swings on the practice range. 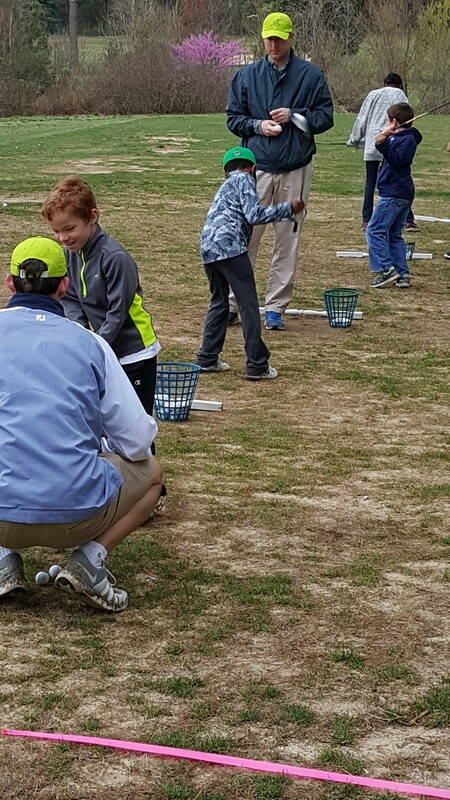 The instructor used those teaching tools – the basics of the SNAG equipment created for Jerry Rich’s Kids Golf Foundation program at Rich Harvest Farms in Sugar Grove, IL. – to stress the requirement of respect for playing partners and how to score per hole. Then it made sense to me. Fortunately, the first session concluded with some hitting of golf balls. That to me was a must. Just talking about the game wouldn’t have been enough to sustain the youngster’s interest. With five hitting stations available each youngster took four-five swings with a pitching wedge, then another took over. After several rotations the club changed to a 7-iron. The 90-minute session concluded with each hitting a driver. In each case instructors put the ball on a short tee to encourage success for the youngsters, and it worked. I was surprised how many could get the ball airborne for more than 100 yards. Most important they went away happy, with a feeling of accomplishment. Before leaving, though, each was given a string backpack emblazoned with the First Tee logo. Each contained a golf cap, golf balls, tees and a program book that included homework assignments to be completed before the next session. My prediction: Sterling’s is in for a good time with his First Tee experience over the next two months, and another future golfer will be the result. 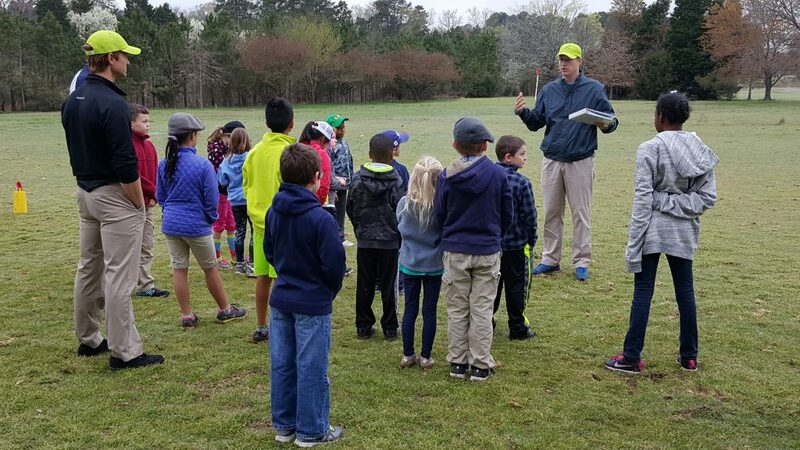 A talk about showing respect was a key component to the first session at First Tee of the Triangle.